That was the intro. You are probably wondering what is a touchless and touch wash. I will walk you through every step in details. This article will be jam-packed with car cleaning tips and tricks and it’s going to be the ultimate guide to cleaning your car. 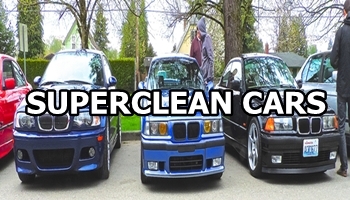 This super clean process works on any car or trucks. What we’re going to be doing is we’re going to be taking the car paint and we’re going to be stripping it clean of any contaminants like dirt or oils. We are going to remove that old wax that you probably still have on the paint, and then we’ll add a brand new protective layer of sealant which will not only protect the paint surface, but it’ll give it a long-lasting deep mirror shine. Before you start cleaning your car, you have to make sure that you don’t have any watches, rings or jewelry on you which will scratch the paint while cleaning. Make sure you are wearing soft clothing without any zippers or buttons or even a belt buckle, so if you rub up against the car, you are not going to scratch the paintwork. If possible, park your car in the shades so it will be cool to the touch. You will be working with some chemicals and they will evaporate on a hot surface leaving water marks. Avoid using brush paper or old clothing to clean your car. Those products don’t provide good scratch protection. What you need to be using is a microfiber towel which will pull dirt away from the surface of your paint. Make sure you rip off the tag before you use your microfiber towel. The first step is the touchless wash. If your car is very dirty, you have a bigger chance of scratching it while cleaning it. All of the dirt acts like a grate, so we want to start off with removing as much dirt without actually physically touching the car. To do that you are going to use a power washer. ( this is the power washer that I bought on amazon.com) With the power washer, you want to make sure that the spray pattern is wide and not a narrow pattern because that could damage your paint. Even though the spray pattern on the power washer is set too wide, make sure you stay at least a foot away from the paint to prevent damage. If you don’t own a power washer, and you cannot get one from your friends, you can still use a regular hose and nozzle. You won’t have to worry about how narrow the pattern is because hose pressure won’t damage the paint. Rinse the car off. The plan is to remove as much as dirt possible, without even touching the car. Start from the top and work your way downwards because with gravity dirt is going to run downwards. Don’t come too close as you might damage the paint with the nozzle. Don’t stress it if you cannot get all the dirt. We will clean it in the next step. After hosing off as much dirt as possible, now what you are going to do is remove the nozzle and grab the foam cannon (you can get one on amazon.com). In the foam cannon, you are going to be using some water and dish soap. You might be thinking why are we using dish soap? The reason why is because what you are doing is de-greasing the whole vehicle. you’re trying to remove as much dirt wax, anything that’s on this car you want to remove so you’re at the bare paint. When you’re normally cleaning your car, you don’t want to use dish soap, you want to use a car soap, something that is a high foam formula and also on the back on the product and look if it says it won’t strip wax. That’s very important. In this case, we want to strip the wax which makes the dish soap perfect. Hook up your foam cannon and you guys are going to love this if you clean your own car. Press the trigger and the foam cannon will spray a thick layer of foam onto the car. Take your time and cover all of the vehicles. This step is just satisfying. We want the car to soak in the soap and as that soap drips downwards, it’s going to loosen up all the dirt and grease, and it’s going to pull it down off the car. After the car soaks, rinse it off. The next step is doing the touch wash. For this step, using two buckets is essential. Always clean out your buckets and remove the dust and grit that might have settled in the buckets while they’re being stored in the garage. For this, you can use a grit guard which slides into the bottom of the bucket and traps dirt at the bottom where your towel can’t get to. Two buckets are needed because one bucket will have the grit guard in it and will be your rinse bucket, and the other bucket will have soap in it and will be your clean bucket. Now, with both buckets filled up, it’s time to talk about towels. Any time you touch your car you want to use something that won’t scratch the paint and I highly recommend a microfiber wash mitt (get one on amazon.com). These towels have little fibers that will trap the dirt and grit, thus reducing the chance to damage your paint from scratching it. Start in an opposite direction of the Drake song ”Started from the bottom, now we are here”. Clean in a straight back and forth motion. You don’t want to make circular motions because if you do scratch the car by mistake, circular scratches could be seen at different angles and they’re a lot harder to remove than straight scratches. After cleaning a panel on a dirty car, your wash mitt is probably dirty. So, rinse off your wash mitt in the rinse bucket, agitating the wash mitt against the grit garden to try to rub off any dirt, then dunk the towel in the soap and get working. You can split the car into two sections. Clean the top part first, because there isn’t much dirt there, then clean the doors, and the side of the car, then move to the hood. Keep the paint lubricated with soap and clean with straight lines and don’t forget to rinse your wash mitt as it gets dirty. Next, move to the rear bumper. Go into details. Don’t forget to clean the spoiler and the trunk. Heck, I even open the gas tank and clean the gas tank cap. That is what I call cleaning in details. Move to the bottom half. Make sure you clean the door jams. Many people don’t pay attention to them. The super cleaning process demans your full attention. So, don’t forget the door jambs, and as you start cleaning the bottom of the car one of the biggest tips is to be careful of your towel touching the ground. You don’t want to touch the ground because it’ll pick up all types of dirt, rocks, and debris, and then when you bring your towel back up to clean the paint, you’re going to be pushing that stuff into the paint causing scratches and that’s definitely not what you want. After touch washing your car, rinse it off and move to the next step. At this point, the car should be pretty clean, but not perfectly clean yet. You want to remove the contaminants from the top layer of the paint and for that, you are going to use a clay bar. It’s really easy to use. Now, before you begin clay barring the car, how do you know if your car needs to be clay barred or not? The way I check it is by touching the car paint with my hand. If it feels gritty and not smooth, you have contaminants on your paint so you should clay bar. If it feels smooth then I would check another body panel to make sure, and in that case, if everything’s smooth you don’t need a clay bar your car. To start, you need something to lubricate the surface that you’re rubbing against. You can use soapy water for lubrication. Typically clay bar kits come with a detailing spray, but those sprays are usually oily and you just did so much work decontaminating your paint and removing the oils that you don’t want to use a detailing spray. (You can get your clay bar on amazon.com). Start off by picking a panel that you’re going to work on, then spray down the panel with your soapy water lubricant. Grab the clay bar and work your way on the body panel. Don’t go in circles. Make sure you move the clay in straight lines, back and forth. Do not press too hard. Medium to light press is all you need. As you are working on the panel, you will feel that some areas are rough and more resistant. Clay those areas until it feels nice and smooth. Even though you just cleaned the car, check out all the embedded contaminants you just removed. Remember to always lubricate the paint. Rinse it with water so the clay doesn’t dry fast. Take a closer look at a random part like bumpers. If you see any black specks embedded into the paint, clay bar the paint with a little rubbing back and forth just a few times. After cleaning the whole car give it a quick soapy wipe down to remove any contaminants that you might have loosened up and then rinse all the soap off. the car. Drying the car in preparation for your paint correction, because you want to be able to see where there are any scratches on the car, and it’s easier to detect any scratches when your car is dry. For this step, I am always using a microfiber towel (check it here on amazon.com). There is a specific drying microfiber towel with deep fibers which will trap dirt but also absorb a lot of water. I don’t suggest using a drying chamois or silicone squeegee to dry your car. If there is any dirt on the car paint, these products will just push it against the paint and scratch your car. So, drying your car is straightforward. Start from the top and work your way down, drawing straight back and forth motions with no circles. Don’t press too hard on the towel. Just kinda glide is smoothly. These are the drying tips that I use, you might have your own. After you dry your car completely, it’s time to move to the next step. So, with paint correction, you’re going to fix any damage to the clear coat. Shat you want to do is you want to grab your bottle of soapy water and start inspecting the paint. What you’re looking for are any light scratches. To see if your paint scratches can be fixed, spray them with soapy water and then wipe them down with a microfiber towel. If those scratches disappear, that means they’re clear coat scratches and we could easily fix them. 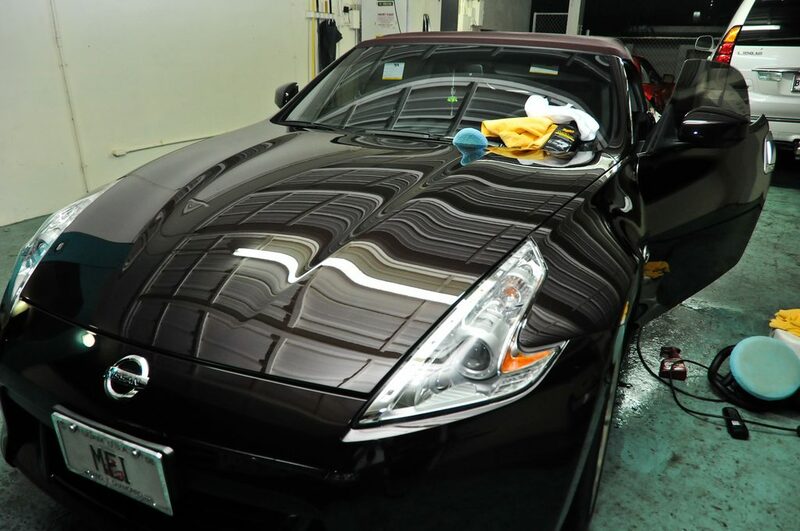 After you inspect the car and know where all the clear coat damages, you could start your paint correction. To fix the paint, first get the surface wet with soapy water. Then wet sand the scratch with 3000 grit sandpaper to knock down the deep scratches. Then sand with 5,000 grit to smooth the scratches out. Next comes polish. Buff the polish into the paint which is going to permanently remove the very fine scratches. Spray the area with a soapy water and wipe it down with a microfiber towel to remove any remaining oils from the polish. Use this process for all the scratches that you found on your car. If you have swirl marks, really fine scratches, discolored paint, what you want to do is, you want to use a polish (grab your polish/scratch removal here on amazon.com). Polish is basically a scratch remover. It’s like sandpaper, except even finer. The way polish works is by removing the top layer of the coat and applying a new layer of clear coat. Now, whenever you apply polish, I like to use a white applicator because if you polish too much and go too deep into the clear coat, then you’ll be going into the base coat and you’ll know because you’ll see your car paint on your white applicator. So put some of the polish on your foam applicator and you want to lightly just massage it into the paint. Go in circular motions. Polish is the one time you want to go in a circular motion because you need to attack these scratches and faded paint in all different directions, not just one direction. Focus on the scratch area, but also attack the wider area because you don’t want to have a harsh contrast between the old and freshly polished paint. Press moderately hard with your foam applicator. Buff that paint good with circular motions. After it’s all buffed, then come in with your microfiber towel and straight lines back and forth. Any areas that you do the paint correction on and use the Polish, wipe down the area with some soapy water to remove the oils that polish contains because you’ve been working so hard to remove any grease from the surface of this paint, so your sealant could stick on our last step. I want to be clear about something that a lot of people have misconceptions about. You don’t want to polish your paint as part of a routine. 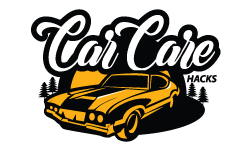 By polishing your car, you are removing that clear coat, and you only want to d that when you need to do paint corrections. I hope this will help you understand how polish works. Pick any place that you want to start on. I like to start at the front quarter panel and do two panels at a time. Get your sealant on the applicator pad and you want to add a thin layer of sealant in a back and forth motion. Apply it until you don’t see any reflection on the paint. Every wax or sealant is different, so you want to check the back for the instructions and see if it says how long it should take to dry. It’s usually about five to ten minutes for the sealant to absorb into the paint. As this sealant dries, work on the next body panel. When you’re applying your wax to an area where there’s black trim, you want to make sure that you don’t get the wax or sealant on the black trim because that will turn white and it makes it really difficult to get off. If you come by an area where there’s trim, buff it with a microfiber towel just to be sure you don’t get any white residue on the trim. Once you finish buffing it off with you black microfiber towel, go with you finishing towel. The idea here is you just go over it once to remove any residual wax or sealant. Go over the whole car. Make sure you cover all the spots. Once you finish buffing the whole side of the car, you just want to quickly inspect and look for anything that you might have missed, because as that wax dries or as that sealant dries, it will show up a lot more than when you first start buffing it off. After you wipe off your wax or sealant, sometimes around the badges you could get a buildup of wax in the crevices of the badges. That’s where one of the detailing brushes comes in handy. Brush away all the excess dried wax that was left there. Start off by rinsing your wheels to remove the dirt and brake dust. If you have a pressure washer fine, if not, do this step with a regular hose. Spray your cleaning solution on one wheel at a time. I use Car Guy’s Wheel solution (you can grab yours here on amazon.com). It’s a pretty good and cheap product. Grab a soft bristled wheel brush and brush the wheels. Make sure you are using a soft version brush because you don’t want to scratch your rims. Be theral. Brake dust likes to hide into the tiny spots. Make sure you clean the inside and out of the wheel. While you are down there, make sure to clean the wheel fenders. The mud and dirt go up the fender. If you don’t clean it now, in the next pothole all of the dirt and mud will just fall onto your wheel and make it dirty. Rinse the wheel and the fender with water. Use a clean and dry microfiber towel to dry your wheels. Make sure not to touch the ground with the towel while drying your wheels. Dirty microfiber will just send you to square one. Clay your wheels. Spray your wheels with some kind of lubricant and then with a clay bar and straight motions rub your wheels. After that, wipe them with a clean microfiber towel. Time to polish the wheels. Apply your polish on your wheels, one at a time. You can apply the polish by hand or with an electric drill. After you are done, wipe the wheels with a microfiber towel. Repeat on all 4 wheels. Wax your wheels. Waxing is what will give you that extra shine and will protect your wheels. Waxing your wheels is same like waxing any surface. Apply the wax, spread it with circular motions. When you are done, wipe it with a clean microfiber towel. Repeat on all 4 wheels. And that my friend is how you super clean the exterior of your car. Follow the steps and you will achieve amazing results.